We are dedicated to supporting the needs of people suffering sensory loss, and their families and to help us achieve this we are looking for Volunteers for a wide range of jobs. Volunteering can be a rewarding way to help in the local community at the same time as meeting new friends, developing skills and exploring hobbies. There are many different kinds of opportunities available depending on the time you are able to give: whether you have an hour or so each week or can give much more. Volunteer Jobs vary from being on the Board of Directors to collating mail shots. If you like to write you may want to do press releases or Tweet. If you just like helping people maybe you would consider being a reader for someone with visual impairment or help them with shopping or drive our clients into activities. All Volunteers are DBS checked and given in house training on all aspects of helping people with sensory loss. Volunteers are really appreciated here at Forest Sensory Services. We know that our volunteers are giving us a valuable gift – THEIR TIME. 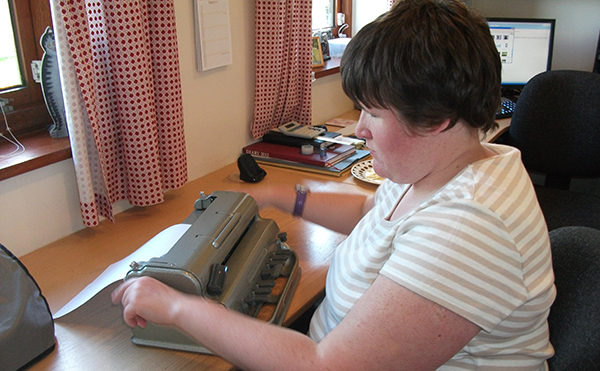 Amy is a member who has been regularly volunteering here at the centre. Establish a “Friends of FSS” fundraising group. Encourage your Company, school or other organisation to nominate Forest Sensory Services as your Charity of the Year. Remember Forest Sensory Services in Your Will to benefit future generations.